Having a large budget is a definite advantage in the recruitment process. But we all know that this is almost never the case. The good news is, it doesn’t take deep pockets to attract top talent. All it takes is, human touch combined with cost-savvy strategies such as networking, referrals and online brand marketing. Money isn’t always the key to everything – especially for recruitment. Candidates with families or globe-trotting millennials may have other more important considerations than a six-figure salary. A flexible working schedule or “work-offsite Fridays” are definite come-ons to people prioritizing work-life balance. Meanwhile, travel perks or opportunities overseas may appeal to the millennial wanderlust. Michelle Merritt of Merrfield Resumes and Coaching shares that other attractive benefits could include educational and mentoring opportunities, a reputation for being a fun workplace and a string CSR program. The key is knowing your potential hire, and identifying their priorities. There’s a cost to every individual recruitment, so the easiest most straightforward way to save is to focus your attention on select candidates. This cuts down on the time you go through the applications and the actual interview process. More importantly, this specialized mindset means you can research and engage with your top candidates better, thus allowing you to make better hiring decisions. Always remember that Google can be your best friend or your worst enemy. It is after all, your company’s first touchpoint with prospective hires. So, make sure that you’re telling a good brand story — in your own website site, related social media pages and niche forums. Turn the spotlight on your company culture and your employees. Aside from being a platform to tell a good brand story, the Internet gives you access to online recruitment tools like social media. These tools utilize analytics, matching and data processing functions that lead you to good talent prospects. You will of course need to review the data given to you further, but the information generated by these tools is definitely useful. The best aspect about these tools? you can get them at a low cost, or even for free. Everyone who comes in for an interview has already invested time and effort, so make sure that you make it worthwhile. Make sure that they’re comfortable, offer refreshments and introduce them around the office. It’s important to give them a taste of how it will be like to work in your organization. If you decide to pass on a candidate, you owe them an honest and respectful response. Avoid statements like “your skillset is not aligned with our requirements at the moment,” instead provide them actual feedback. If they don’t have enough experience in a particular area, tell them. Constructive comments will open up dialogue, and who knows? You may be able to recruit them for another role in the future. Always remember that potential hires and referrals come from the most unexpected of sources, so, treat every interview with care! Larger organizations have to go through many layers of approval before they can make a decision on a potential hire. So, one definite advantage for smaller businesses is that they can make decisions quickly – sometimes even on the fly! Leverage on this and make sure that you can make an offer the moment you identify the best candidate. While that big-shot conglomerate is still getting their approvals routed, make sure that you have already made your offer. Your best – and free—source to find your next hire may be sitting right next to you. 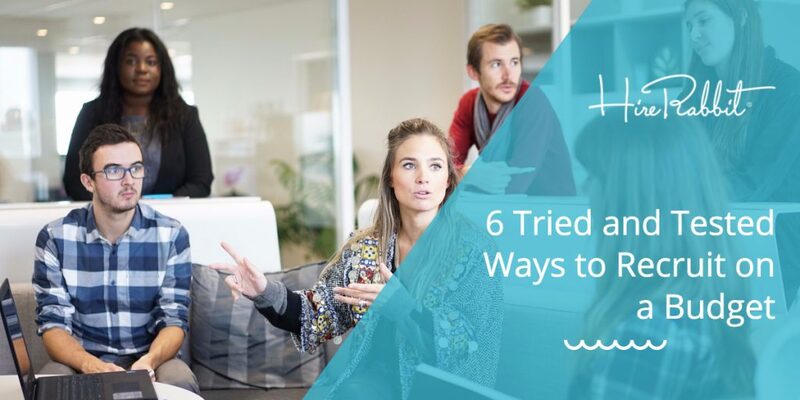 Have you ever tried asking your colleagues the top three people they want to bring in? If not, then go ahead and do so! Existing employees already know your organization and its needs the best. They know who among their circle can fit right in your company culture and excel within the bounds of your organization. Save yourself the hassle and the expense of that job ad, and have that conversation with colleagues now. Hiring on a budget really boils down to smart strategies and leveraging on the human connection. Do you have your own tried and tested cost-efficient recruitment tips? Share them in the comments below. Visit HireRabbit to get more tips on how you can improve your employee recruitment.